You can find a tutorial about the home page here. Display the sidebar on the Home Page? This determines if there is a sidebar on the home page. 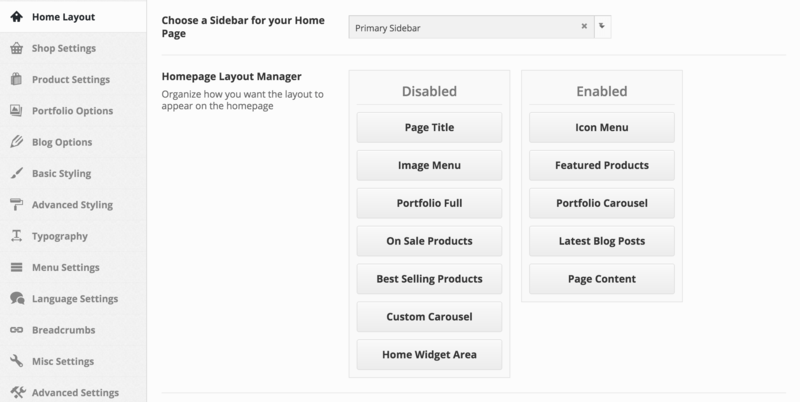 If you are using a sidebar on your home page select which one using this select box. This is where you build your home page. Using the manager you drag and drop what you want enabled to the right “enabled” box. You can sort the order by dragging and dropping as well. This allows you to create as many images menu items as you would like. Just open the box, give it a title. Upload an image, link your image to a page on your site or link to anther site. Add a description. Remember to always use images large enough to fill the space. The theme will crop images to the right size so use large images. Sets the amount of columns for the image menu. Sets a height for the image menu. This allows you to set the title for the featured product carousel. Remember products for the featured product carousel are set by featuring products in the woocommerce product edit page. Sets the amount of columns for the product carousel. Sets the amount of products do display in total in your carousel. Choose how the product items scroll. This allows you to set the title for your blog posts on the home page. This allows you to set how many blog posts you would like to show on the home page. This allows you to only show one category of blog posts on the home page or show them all. Determines how many words are in the post excerpt. This allows you to set the title for your carousel portfolio posts on the home page. This allows you to only show one type of portfolio post on the portfolio carousel home page or show them all. Set the amount of columns for your portfolio carousel. Set a height for your portfolio items, or leave blank for theme default. Sets the amount of portfolio items to display in total in your carousel. Choose the carousel speed (in seconds). Choose how the portoflio items scroll. Click the check box if you want to show the portfolio types under the title on your home page portfolio carousel. This allows you to set the title for your custom carousel on the home page. This allows you to create as many custom carousel items as you would like. Just open the box, give it a title. Upload an image, link your image to a page on your site or link to anther site. Add a description. Remember to always use images large enough to fill the space. The theme will crop images to the right size so use large images. Set the amount of columns for the custom carousel. Choose how the custom items scroll. Choose to enable custom image ratios for this carousel. This allows you to set the title for your full portfolio posts on the home page. This allows you to only show one type of portfolio post on the full portfolio home page or show them all. Set how many portfolio items you would like to show in your full portfolio settings. Set how many portfolio columns you would like your portfolio items to be organized in on your home pages full portfolio. Set the order of your portfolio items on the home page. Set the height of your portfolio items, or leave blank for theme default. Enable masonry layout on the home portfolio. Click the check box if you want to show the portfolio types under the title on your home page full portfolio. Display Lightbox Link in Top Right Corner? Click the check box if you want to show the lightbox link in the top right corner on your home page full portfolio. Choose whether you would like to show full post or post or post excerpt on the latest post page. Selecting this will change the blog format from default to grid format.